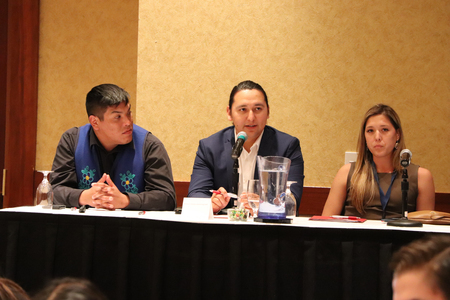 The EDO Panel was comprised of Jordan Peterson (left), Gwich'in Tribal Council, NT; Dustin Fiddler (middle), Waterhen Lake First Nation SK; Keshia Moffat (right), Eel River Bar First Nation, NB. The Entrepreneurship Panel was comprised of Heather Abbey (left), Indig Inc.; Jenn Harper (middle), Cheekbone Beauty; and Eugene Whiskeyjack (right), WJ Consulting Inc. The Entrepreneurship Panel was comprised of Eugene Whiskeyjack (left), WJ Consulting Inc.; Heather Abbey (middle), Indig Inc.; and Jenn Harper (right), Cheekbone Beauty. Eugene Whiskeyjack speaks with delegates about sourcing and securing outside funding for projects.